Help your kids clean up their act with our cute animal storage bins. Well sized for storing toys, books or laundry our storage bin measures 17.5" in height and 17" in diameter. Made of a cotton canvas our bin is tough enough to hold whatever you throw in it but cute enough to complement the best dressed home. A great space saver our bin folds easily away when not in use. The 3 Sprouts storage bin is a perfect gift for babies, toddlers and kids. Made in China. Care instructions: exterior - spot clean only interior - fully coated on the inside, each bin easily wipes clean using a damp sponge. Great size and quality I will be buying more !! love this bin! we have a total of 5 now? super happy with the size of it, holds lots. love the designs and the tough material. nothing but good things to say about these! I use this as a fold-away laundry basket for my small condo, and its perfect. Its nice and sturdy and holds a lot, plus the raccoon is super cute. 3 Sprout products are super cute, well made and great for storing kids toys, blankets and stuffies. We have a number of different products from this company and have yet to be disappointed. Already had one for my oldest, now bought this one for my youngest. We used them to store stuff animals. Fixes her entire collection. Well made & super cute! 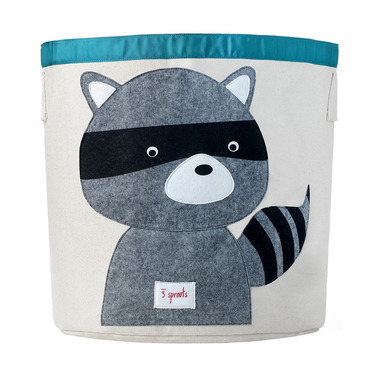 I bought the deer hamper for my daughter and loved this racoon print over all the other hamper animal ones so I ordered this storage bin to use as a hamper for my baby son. It is as everyone commented a lot larger than I expected and not as stiff to stand up like the actual 3 sprouts hamper I'm still very happy with it. There are handles on the side so it makes it easy to carry to the laundry room. So cute!! It also stores so many toys! I have two of these, the raccoon and the bear. I adore them! As other reviews have said, they are huge! I keep all of my daughter's infant toys in them in the living room and it contains them so well. The sides aren't rigid which is great for storing oddly shaped toys. I also like the handles, they are sewn to the sides of the bin and do not stick out. Highly recommended. These canvas bins are great. They are larger than I expected & hold a lot of toys. Great toy bin. Cute and sturdy. Love these bins, between my mom, myself and my brother we have 4 and are planning to purchase more, they hold everything from toys to stuffies and my mom even uses them for her boots and shoes as they clean so easily inside with just a quick wipe. The kids love them too, such a great product. this is my third bin in this size. love these bins. so cute and great for storing a ton of toys... stuffies, dolls, cars and trucks. wish they had the same width and depth just not as high to store dog toys too. These bins are great. Very well constructed and hold tons of toys. I keep them in my living/family room where I don't want to see toys all the time but want a stylish place to store them. Love it! Way-way bigger than I thought it would be. Fits a ton of stuff and holds its shape really well! I have this little critter.. and the fox. They are awesome! Very nice bin. It's a great size for toys and odds and ends in my boy's room.